Can you believe we’ve already completed so much school by mid September?! In terms of safety and traffic, the beginning of the school year has gone wonderfully well. Thanks to all of you who are already following the directions of our safety staff, and thanks for your continuing efforts to do so. If you missed the email about it or need a refresher on safety policies, view them on the school website here. Please send any new updated addresses, phone numbers and emails to our registrar, Brenda Diaz. We now direct everyone to the online School Directory for the most current information. On Tuesday, September 19, over 1,000 people will attend the traditional Family BBQ to enjoy superb food and company and to experience a wonderful gathering of our community. I hope you can join us! Registration ends Friday, September 15 at 11:59 pm. To reserve your tickets, click here. The 7th Grade Trip departs for Cedar Lake in Big Bear on Monday, September 25 at 8:30 am from the upper parking lot on Crown Avenue (arrive at school by 8:10 am) and returns on Friday, September 29 at approximately 2:00 pm to the same location. Back to School Night is Thursday, October 5 at 7:00 pm sharp. This is the evening in which parents visit their students’ classrooms. Students will bring home more detailed information about the event in the coming weeks. This fall the Parents Association will kick off our Community Speaker Series with two great events. Please save the following dates. There will be a Pep Schedule on Friday, October 20 in honor of Homecoming. The school day ends at 2:02 pm, followed by the school-wide pep rally and powder puff football game. The JV football game will begin at 4:00, with the Varsity game vs. Mission Prep afterward at 7:00. The In-N-Out truck will be there, but please remember that the truck is cash only. We hope to see you there! Parking is available in the upper and lower lots, as well as at St. Bede’s and St. Francis, on a first come, first served basis. We respectfully request that you not park in front of our neighbors’ homes. Beginning this fall on a trial basis, the daily bulletin will include sports and dismissals, the lunch menu, college visits for the day and the daily schedule of events. Detailed information about school-wide events and club meetings will be emailed to students based on their interests and grade levels. The college counseling office will send a weekly list of the colleges visiting Prep to juniors and seniors. It's not too late to sign up for Flintridge Prep's Orchestra program, which meets every Thursday morning. Our new music maestro, Mr. Margitza, is welcoming passionate instrumentalists to the ensemble, so please stop by the Music Room to find out more. The Middle School Dance Company is back this year, and Mrs. Mattei invites all 7th and 8th grade students to come try out. The group will meet one day after school each week to work on exciting dances plus perform in the dance concerts. See Mrs. Mattei about this fun opportunity. The Fall Play, Failure: A Love Story, featuring the talents of the 10th-12th graders, will have three performances on November 3 and 4. And lastly, auditions for this year's musical, Hello, Dolly!, will start October 10. Details will be unfurled later this month, but you can bet on this show being an exhilarating experience for everyone in the Prep community. We invite everyone to come enjoy our students performing this year in so many fun and memorable ways! The visual arts department has invited architect and paper artist Jeff Morrical to campus for a community block workshop on Thursday, October 5. Mr. Morrical creates large artworks using the “Miura” fold, an origami technique developed by astrophysicist Koryo Miura for collapsing solar panels. Workshop participants will have the chance to blend science and art as they make their own Miura pieces. The visual arts department would also like to thank Prep’s Fathers Club for the generous donation of equipment, including an electric kiln (that can be monitored from an iPhone! ), digital cameras, new Apple computers and a dual extrusion 3D printer. These high tech additions to our studios will expand creative opportunities for Prep students in all areas of the visual arts. Prep's annual STEAM & Service Fair includes science fair projects, robotics club displays, community impact projects and more. The fair is open to 7th – 12th graders and will be held February 8 and 9, but it's not too early for students to begin a project. Students who are planning to complete a project that involves tissues, human subjects, vertebrate animals, microbes or hazardous chemicals must apply for pre-approval by November 7 in order to be eligible for the LA County Science and Engineering Fair. For more information, contact Laura Kaufman. Seniors: We have completed meetings with senior families and look forward to beginning the application process with each student. College Counseling class began the week of August 28, and an email has been sent to parents that includes the course syllabus and additional documents pertaining to each week’s course topics. We will be meeting weekly with seniors in addition to scheduling 1:1 meetings as needed. Parents, feel free to contact our office if you have any questions or concerns about where your child is in the process. Your child’s counselor is happy to update you on his/her progress anytime. Starting next week, we will be scheduling appointments with each senior who plans to submit an early application. As soon as your child confirms the school(s) to which they’d like to apply early, and has a completed Common Application essay draft, a meeting with their counselor can be scheduled, and work for the November 1 deadline will begin. Juniors: A reminder: Prep college counselors do not recommend juniors sit for the ACT or SAT until March or April 2018. The focus needs to remain on the student’s academic coursework this first semester. If you have questions about our testing plan, feel free to call our office at (818) 949-5510. Save the Date: Junior College Night is Wednesday, December 6 at 7:00 pm in Norris Auditorium. This evening is for parents only. We will welcome a college admissions dean who will help us launch the college process! Financial Aid – Juniors & Seniors: Parents are invited to attend two evening programs this fall to outline the college financial aid process. The first evening will take place in Prep’s Norris Auditorium on Tuesday, September 26 at 7:00 pm, offering a general overview of the process. The second evening is scheduled for Tuesday, October 24 at 6:30 pm at Flintridge Sacred Heart Academy. This program will walk parents through the FAFSA form specifically. Feel free to contact the college counseling office with any questions regarding the events. Over the summer, Flintridge Prep was named the State School of the Year in Division 5 for athletics by Cal-Hi Sports! Prep was recognized for the success of its teams across the board, led by the state title of the girls’ cross country team. The cross country teams have been training diligently all summer as they approach their season openers, with eyes on the podium for CIF and State once again. The football team is off to a fast start with a win over Fulton Prep, girls tennis is trying to maintain the momentum established last year, advancing to the CIF semifinals. Girls volleyball is expecting to advance to the CIF playoffs for the first time in 10+ years. Boys water polo is 3-0 and is seeking its 4th straight League title. Come out and support the Rebels! The 2017 – 18 ACL members kicked off their summer in June hosting the 4th annual Boys and Girls Club Summer Camp on the Prep campus, followed by the JP Blecksmith 5K Run on July 4th in San Marino. Seven of the 16 members of the ACL also traveled with Mr. Manuel Nuñez for the Nicaragua Initiative. They visited the children of La Mascota Hospital and Hogar Belin in Managua and visited a small school in San Benito, where they worked for five days building a small library from the ground up for the school. 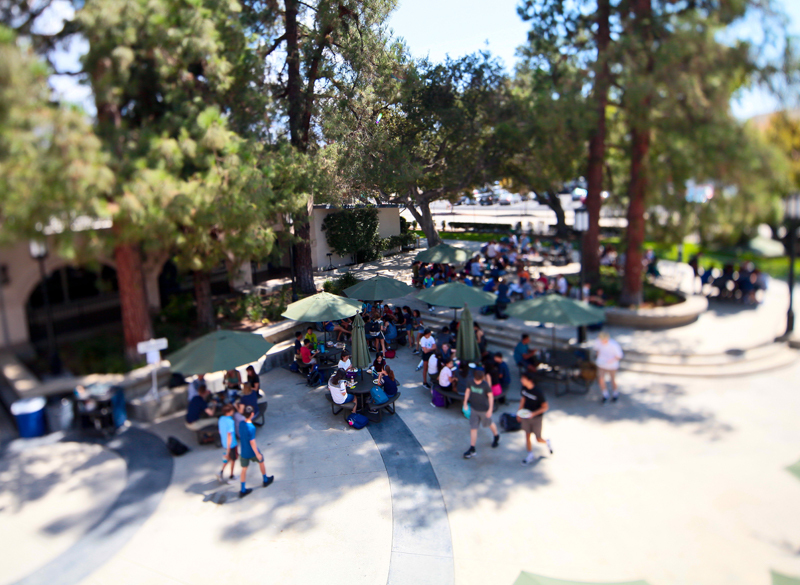 On August 17, the Big 3 travel to Big Bear for their leadership retreat, where all three groups plan their initiatives for the school year and learn each others roles as leaders in the community of Prep. The ACL would like to invite everyone in the Prep community to be a part of the initiatives throughout the year. If you are interested or have any questions please contact Alex Rivera, Director of Athletic Initiatives, at (818) 949-5564. For ACL news, events, updates and photos visit the school website. The 2017-2018 school year is off to a great start for Student Senate! The Book Day BBQ was a huge success, with activities such as a puppy petting area, a dunk tank, an inflatable obstacle course and lawn games. Student Senate would like to thank the Parents Association, the Student Community Action Council, the Athletic Council on Leadership and all members of the Prep community for helping make Book Day such a memorable event. While school just began for the students, our volunteers have been working through the summer. Thank you to all the Parents Association committee chairs and the many volunteers who assisted in back to school events: Abigail Deser and Juliette Harrhy, who coordinated over 100 parent volunteers on Book Day, Terri Miller and Stephanie Kilpatrick (Volunteer Coordinators), Nadine Ono (Summer Mailing) and Michelle Lytle and Annette Starks (Coffees). Thank you to our Grade Level Coordinators, whose work began early in the summer: Christine Lee, Jill Fung, Anjali Bonfante, Leslie Lindholm, Christine Alameddine, Denise Walklett, Michelle Fellows, Gwen Robertson, Bettina Rosenfeld, Trina Unzicker, Clare Tayback and Micheele Noble. And last but not least, a big thank you to Jennifer Stetson, who graciously agreed to take on the role of Treasurer for the next two years. During August and September, the Fathers Club hosted and supported several school events. Eric Kristensson and Gene and Deanne Detchemendy hosted 125 dads at the annual Back-to-School Mixer. Bruce Blair and his dad volunteers served as greeters and bartenders at the 7th and 9th Grade Coffees. Please join us for our first Fathers Club meeting on October 18 in the Chandramohan Library. Refreshments begin at 6:30 pm, and the general meeting starts at 7:00 pm. Our kids have a lot of activities at Prep in addition to the amazing academics. Let's better understand why those activities are important and helpful. Entering into its fifth year, the successful Prep Internship Program is being directed by David Hitchcock and his parent volunteers. The Internship Program for college-age alumni truly reflects the Prep for Life mission. To date, the program has arranged a total of 74 high-quality summer internship positions spanning professions from finance to engineering, journalism and marketing. Learn more about opportunities to host an internship at your workplace or volunteer for this important program. I hope to see you at the BBQ.